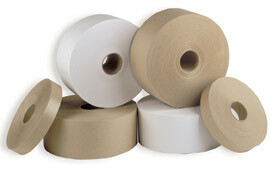 Riverside's Kraft Paper Tape selection is available in Natural Kraft or White. We can custom print our paper gummed tapes with minimum of just 2 cases. Check out our Better Pack and Phoenix Tape dispensers. You're sure to fine a gummed tape dispenser to fit your needs and budget.